I know what you’re thinking, and you’re right: AdventureX isn’t specifically about indie games, which means an article about it on my site might seem a tad odd. But it [AdventureX] is about point ‘n click adventures, interactive fiction, visual novels and similar stuff, all of which I do enjoy a great deal. So… let’s get this seventh iteration kickstarted! Now, since they’re not trying to fund a game, there’s no release dates, no platforms, no alpha or beta tiers for backers. What is however part of the Kickstarter is… Guest List tiers, and with good reason. I mean, the locale is only so large and there’s no admission fee, meaning entry will be first-come, first-serve. Unless you decide to go for either the £40 ($52) Adventure Xtreme or the £100 ($130) Adventure Xquisite tier that is, both of which are – obviously – in limited availability. But I’m getting ahead of myself. Haven’t even mentioned why they decided to hit up Kickstarter in the first place! Unsurprisingly, a large part of the reason lies in “the cost of venue hire”, as they put it. Ain’t exactly cheap, which is why £1,400 of the £3,000 will be put towards that (and catering, because food good). Oh, and something about helping ensure AdventureX 2018. Not a bad idea to be thinking about the future. Not a bad idea at all. We love graphical adventures; interactive fiction; exploration games; visual novels – just about any game with a great story to tell. Since 2011 we’ve been inviting gamers and developers from across the globe to share their experiences and exhibit their games. With 29 days (August 7, 2017) remaining and £,1371 ($1,778) of £3,000 ($3,865) pledged, I’ll be surprised if the funding campaign is unsuccessful. Surprised and saddened, quite frankly, so do at least spread word about it if you don’t fancy becoming a backer. Every little bit helps, and telling your friends, followers, and so on, won’t set you back a single cent after all. 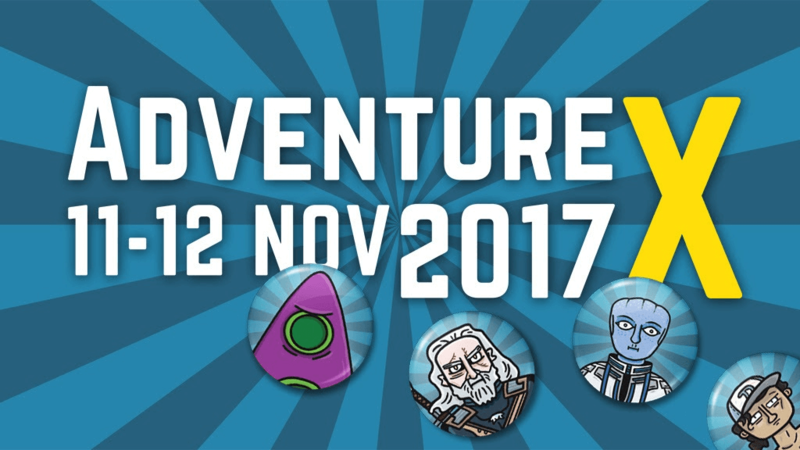 So let’s get AdventureX 2017 kickstarted! Right now! LET’S DO THIS!